China and Asean have long been partners in various sectors – commerce and tourism in particular. Economic and trade cooperation and people-to-people exchanges have grown bigger and wider through the years. To further strengthen this partnership, China and the 10 Asean member states hold the annual China-Asean Expo in Nanning City in the Guangxi Zhuang Autonomous Region and gather government officials, exhibitors, investors and media organisations for days-long exhibitions and conferences. Khmer Times’ Raquel R. Bacay and Long Sour Osoth went to Nanning City last week and witnessed the momentous event. Situated in the southern part of China near the Vietnam border, Nanning City was a perfect location for the gathe-ring of Chinese and Asean governments, entrepreneurs, scholars and experts. 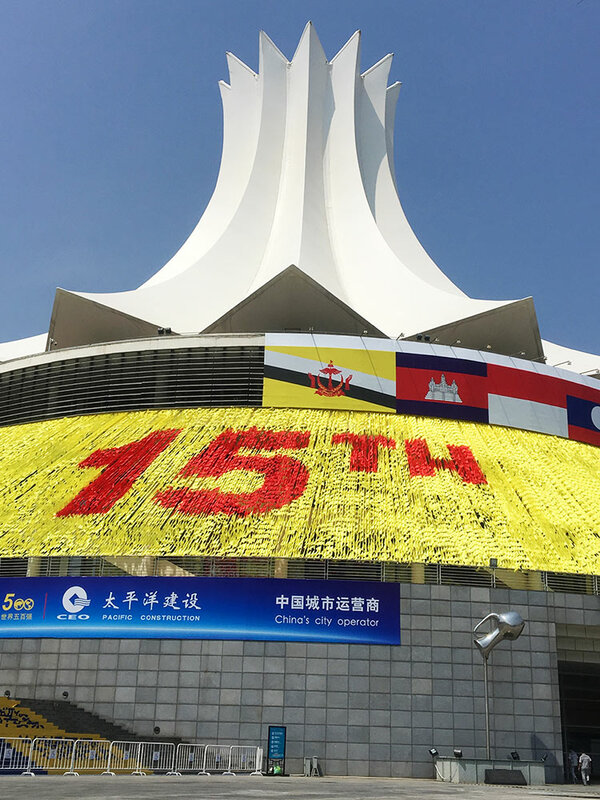 The city’s weather – 26 degree Celsius at most – gave everyone just the right amount of coolness and warmth to enjoy an event as big and as grand as the 15 China-Asean Expo (CAEXPO) and China-Asean Business and Investment Summit (CABIS). 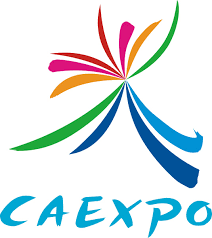 CAEXPO, which started in 2004 after its proposal during the 7th Asean-China Summit in October 2003, is annually held in Nanning, Guangxi to establish an economic and trade platform for China and the 10 Asean member nations. The event integrates friendly communication, economic and trade cooperation and people-to-people exchanges, aiming to deepen dialogue and reciprocal cooperation among the participating countries. The previous 14 CAEXPOs had seen more than 660,000 exhibitors and trade visitors, and facilitated the effective business-matching among enterprises, industrial sectors and chambers of commerce of China and Asean. In fact, during the first CAEXPO in 2004, the bilateral volume fulfilled the goal of USD100 billion one year ahead of schedule. In 2007, the goal of USD200 billion was realised three years ahead of the set timetable. The bilateral trade registered USD514.82 billion last year. 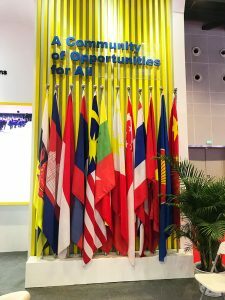 This year, with Cambodia as the expo’s country of honour, the gathering aimed to further strengthen cooperation of countries along the Silk Road Economic Belt and those along the 21st Century Maritime Silk Road, and promote exchanges of China and Asean with other economies to provide abundant business opportunities beyond the China-Asean region. 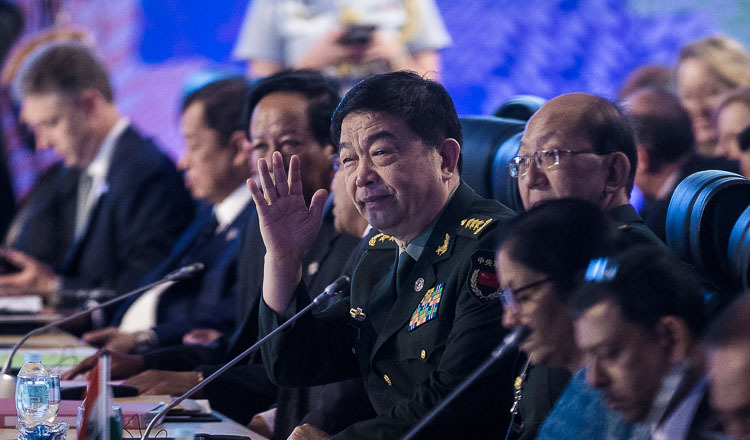 The kingdom, for its part, sent a vast number of high ranking officials to Nanning to show that the government is serious in its participation and is really willing to grow with China and Asean. Cambodia’s participation was also seen as a way to boost the kingdom’s tourism and trade status in the region. 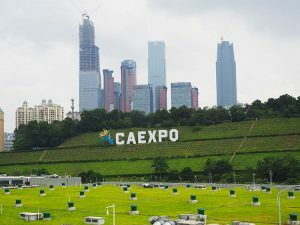 This year’s CAEXPO and CABIS were centered on the theme song “Grand Gathering for Common Prosperity”, which bore lyrics of friendship, cooperation, development and prosperity as the involved countries go through trails and hardships “shoulder by shoulder” and “hand in hand”. 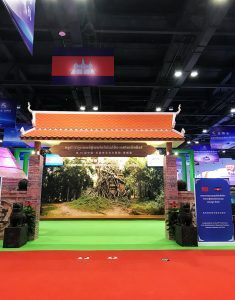 The expo’s mascot, Hehe (which means peace and harmony in Chinese), was also made to represent the strategic partnership of China and the Asean. During the four-day exhibition, security officers were stationed around the Nanning International Convention & Exhibition Center from the start of the expo on the 12th of September until it ended on the 15th. 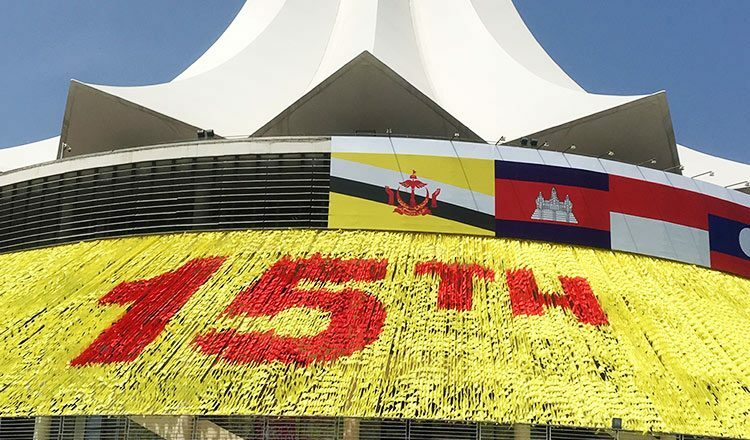 Dozens of delegates from China and Asean, media personnel from the region, exhibition organisers and spectators were safe in and out the huge venue. Anyone who entered the venue was given identification cards – all classified in colours and QR codes – which meant you’d be in big trouble if your name’s not in the system after the security scanned your ID. Since the media have a distinct identification colour, it was easier for us to roam around the exhibition center, check on displays and talk with exhibitors to gather information. With the strict protocols being implemented during the expo, it would even come as an understatement that China’s way of organising and controlling events is its asset. The way transportation for the multi-national delegates was arranged was also commendable. Services came every thirty minutes, bringing guests to the venue or sending them home to their respective hotels. There was even an instance when we missed our service and just decided to take a cab back to the hotel. But the volunteers stopped us and told us not to use any transportation aside from what the organisers had originally set for us. It was easy to interpret such act as too controlling, as we only wanted to go back to our rooms and rest. But after a while, we realised that the volunteers – a mix of students, graduates and youth taking ‘translation’ courses – were only trained to instil discipline and organisation among the delegates. After all, they were taking full responsibility of the safety of each delegate. As first-time attendees of the CAEXPO and CABIS, we found the event as systematic as it can be. Accommodation, transportation and seating arrangements were all regulated. However, the language differences also made an impact on how delegates and organisers communicated. Most of the information given were in Chinese, and instructions to the media were sometimes vague and not concrete. We were allowed to cover exhibits and conferences, but there were times when they failed to inform us that media presence was not allowed in specific meetings. But aside from these, CAEXPO and CABIS offered us a bigger and wider perspective of how China and Asean work together. 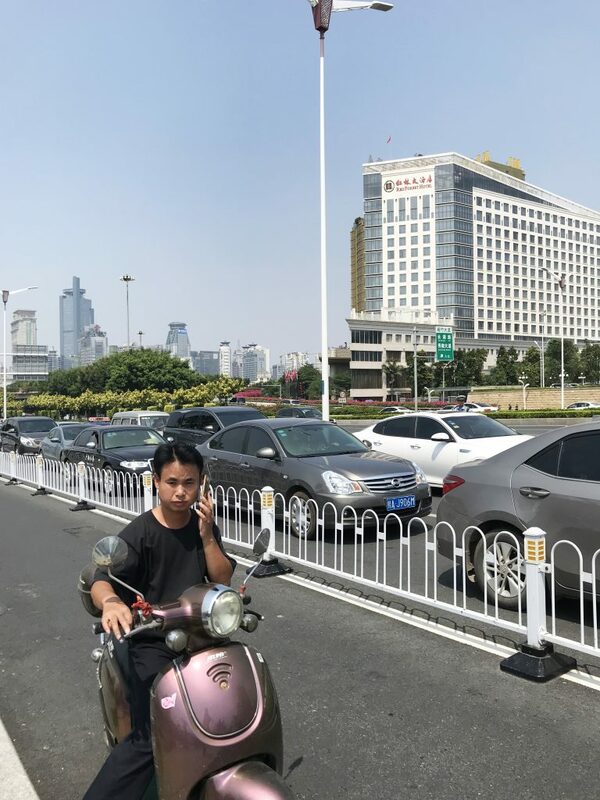 Apart from the expo itself – which was the very reason we flew to Guangxi – what made Nanning City a true standout was its cleanliness and orderliness. The roads were full of electric motorcycles (which makes the road free from the noise we usually hear here in Phnom Penh) and cars, but all vehicles were given specific lanes, making pedestrians feel safe while walking on the roadside. The traffic flow was, much to our surprise, smooth even on peak hours. And despite the tall buildings and modern edifices that sprouted just about anywhere, the city maintained to be as green as possible, with huge and small trees neatly planted around. With the abundance of lush subtropical plants, it became clear to us why Nanning City, an ancient place with a rich culture, is also tagged as China’s “Green City”. And all of these were made possible without jeo-pardising development and modernisation. Call it green urbanisation. 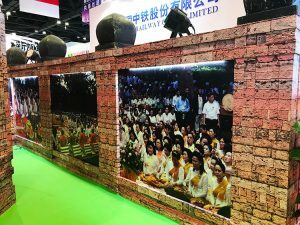 All in all, the 15th CAEXPO and CABIS and Nanning City in general – with the harmonious co-existence of nature and advancement – did not disappoint. They are, in fact, proofs that China and Asean member states are going nowhere but forward.